When submitting a proposal for Gemini telescope time, all overheads associated with science observations must be included, except for those associated with the default set of baseline calibrations. Information on target acquisition times is included on the Observatory's statistics page. Typically optical and infrared imaging observations are set up in 6 minutes, and spectroscopy in 12 - 18 minutes. Use of GNIRS with the P2 wavefront center requires an additional re-acquisition about every 45 minutes due to flexure. Coronography with NIFS adds 5 minutes to the set up time. Altair adds 5 - 8 minutes to the set up time. GeMS laser AO observations take longer to set up, approximately 30 minutes. Additional overhead must be included if the observation is long (more than about 2 hours duration) such that more than one acquisition is likely. Please use the instrument links to obtain up to date information on specific overheads. 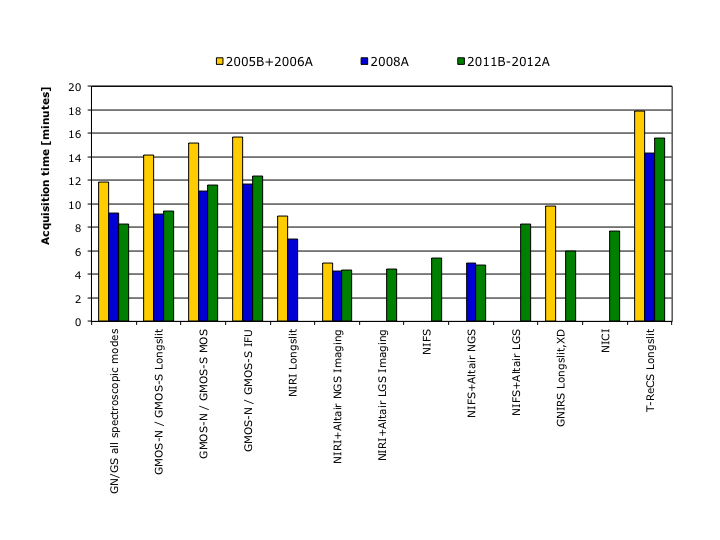 Figure 1: Acquisition times for Gemini North and South instruments during semesters 2005B to 2012A. These values do not include the typical 6 minute slew and guide time. The improvement from 2005B+2006A is due to unifying the acquisition software for the facility instruments. Instrument component changes take around 20 seconds for GMOS, GSAOI, NICI and NIRI filters, and up to 100 seconds for FLAMINGOS-2 filter, grating and mask changes, GMOS mask and grating changes, and NIFS grating changes. Please use the instrument links to obtain up to date information on specific overheads. The detector readout time depends strongly on the instrument and readout mode. For GMOS, the readout time is 18 - 150 seconds, depending on detector area and pixel binning used. Nod and shuffle observations require an additional 200 seconds. For FLAMINGOS-2, GNIRS and NIRI the readout time can be up to 20 seconds, depending on the brightness of the target and S/N required. For NIFS and GSAOI this time can be up to over one minute. Please use the instrument links to obtain up to date information on specific overheads. Telescope offsets take 10 to a few-tens of seconds per motion, depending on the size of the offset. The timeline in the Observing Tool (OT) shows the estimated duration for the initial target acquisition and each subsequent exposure. The initial acquisition time is determined by instrument mode, and the exposure durations are broken down into the time required for integration, mechanism moves, readout and telescope offsets. The time charged to the partner or program is the actual time used and not the OT estimate. The actual time used is measured from the first telescope slew to the end of the last exposure for each observation. Note that the OT time estimate assumes a single acquisition, so that additional overhead must be allowed for when completing your Phase II if the observation is long (more than about 2 hours duration) and more than one acquisition is likely. The investigator does not need to include the time required for the defined set of baseline calibrations, in a Gemini proposal. This time is charged against the relevant Gemini partner. However any calibration beyond this basic set does need to be included at Phase I, and that time will be charged against the program. The time charged is the actual time used and not the time estimated by the Phase II Observing Tool. The partner-charged telescope time used in calibrations at night varies with instrument. For GMOS, calibrations add about 5% to the program time, for NIRI 10%, for GNIRS and NIFS 23%. FLAMINGOS-2 and GSAOI are still settling in to routine operation and a typical value is not currently available. GMOS: bad pixel masks, darks, biasses, fringe frames, GCAL and twilight flat fields, arcs and flux standards. Near-infrared instruments: bad pixel masks, darks, GCAL flat fields, arcs and photometric or telluric spectral calibrators. In addition, for GNIRS cross-dispersed data a pinhole mask spectrum is obtained with the flatfields; for NIFS a "Ronchi" calibration mask spectrum is provided for each wavelength setting. For near-infrared spectroscopy a telluric standard is obtained for each 1.5 hours of science, in the thermal regime this is increased to one for every hour of data; if tellurics are needed more frequently then that time will be charged to the program.